Are you thinking about making a trip out to Sin City? You're not alone. Each year, nearly 43 million people make their way to Las Vegas for gambling, partying, indulgence, and a great time all around. Want to make sure your next trip is unforgettable? We've got you covered on the ultimate Las Vegas travel tips. When you think of heading out to the strip, you may think about blackjack tables and poker games. While gambling and Vegas go together like peanut butter and jelly, that's just a small piece of the fun and entertainment that Sin City has to offer. If you are into gambling, you'll have no shortage of dazzling, spectacular casinos at every turn. Not so much into that scene? You'll have limitless options ranging from incredible shows to classy nightclubs to seriously fun pool parties. Looking to save a few extra dollars? One of the best Las Vegas travel tips is that most casinos offer free drinks to incentivize you to keep gambling. You just need to wait for a cocktail waitress to come around and take your order. Tips are expected, so don't be stingy! No matter where you're staying on the strip, it's always a good idea to look into the resort or casino's player cards. You may receive immediate perks, like a restaurant meal, and you can also earn redemptions for future trips. Best of all? They're free to sign up for and typically only require a few minutes of your time. If you're interested in doing Las Vegas on a budget, you can save some serious cash by simply traveling during the week. In fact, many hotels offer steep discounts for Monday-Thursday night bookings. If you can round up your friends to even shift one of the days to a weekday, you'll be raking in savings. Finally, most of the clubs and restaurants are significantly less crowded mid-week. Less time for you waiting in line, and more time for you to maximize your fun! With all the sunshine and free-flowing alcohol, it's really easy to overdo Vegas. For that reason, it's important to prepare ahead with a few essentials. First of all, pack a pair of comfy shoes for daytime walking. The strip is 4.2 miles in length, and even just basic sightseeing can take a toll on your feet. Second, make sure to pack sunscreen and sunglasses and wear them! If you're traveling during warmer months, weather averages over 100 degrees Fahrenheit. Finally, be sure to drink plenty of water. Whether you're drinking alcohol or indulging in decadent, fancy Vegas meals, it's important to stay hydrated. You don't want medical sickness getting in the way of all your fun! Outside of winning the big jackpot, the next best Las Vegas travel tips include the world-class shows! No matter what your preference, there's a spectacle out there for you, and they are typically at a fraction of the cost you'd expect to pay elsewhere. From Cirque Du Soleil to the Blue Man Group to Carrot Top to Penn and Teller, Las Vegas is home to some of the most amazing performances. Save money by purchasing show tickets in advance! Las Vegas has become a hot spot on the culinary scene with nearly every type of dish available! From fancy steakhouses to entire stores devoted to candy and ice cream, there's a taste for everyone. And, don't forget about the classic all-you-can-eat buffets. If you're a classified foodie, be sure to check out reviews or local websites in order to satisfy your taste buds! The best Las Vegas travel tips are the ones that push you out of your comfort zone- literally and figuratively. Ever had dreams of ziplining? You can do it here. Indoor skydiving? Check. Racing an exotic car? Yep. If you're an adrenaline junkie, Las Vegas is your go-to destination. Take advantage of their numerous attractions and start crossing items off your bucket list. Remember, you're likely to score better discounts if you book events in advance! Love to hashtag or share photos? You may get rewarded by different club promoters and hotel concierges. Use hashtags or tagging on Instagram or Facebook before and during your trip, and you may be able to score exclusive entrance perks. 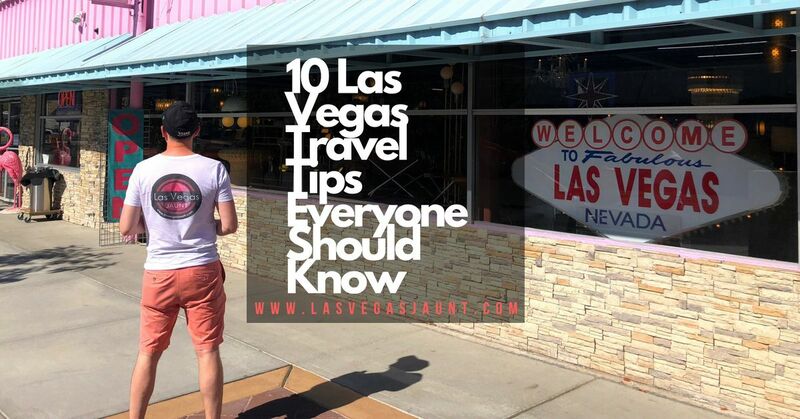 One of our favorite Las Vegas travel tips? There's so much to see and do without spending a single dollar. For example, you can enjoy the Bellagio Fountains water show every single half hour from 3-8 PM. You can window-shop through tens of thousands of different stores. And, yes, as we mentioned, you can definitely get free booze in the casinos. Where you stay can largely make or break your vacation. One of the best Las Vegas travel tips to know is that you can typically score deep discounts on even the best hotels if you know where to look! Each resort has its own charm and unique appeal. You'll want to consider that before making your booking. You'll also want to check out its location relevant to the strip. For this reason, most people tend to prefer hotels that land in the middle of the strip (more central to the places you'll want to go). When you book a trip to Sin City, you're saying yes to adventure, spontaneity, and entertainment! At Las Vegas Jaunt, we're here to help you with every step in your planning process. Be sure to check out our travel guides today! I love seeing your pic of the Show Love since I am one of the performers on that show. So glad you had a magical time in Las Vegas! Thanks for advice us about the Las Vegas as me and my friends are planning to visit the Las Vegas next year. From your blog, I feel that it will be very enjoying & interesting trip. I think places to stay in Las Vegas are quiet expensive. I love this list!! Thanks so much.